Printed version cf. : Ivan Planka (ed. ), Shoes in History 2000. The Collection of Lectures of the 3rd International Conference (Zlin 2001) pp. 184-196. Since autumn 2000 the Deutsche Forschungsgemeinschaft (DFG) has granted a common research project of the Stadtarchäologie Kempten (Dr. Gerhard Weber), the chair of medieval history, University of Constance (Prof. Helmut Maurer) and the chair of medieval and postmedieval archaeology, University of Bamberg (Prof. Ingolf Ericsson). This article is meant to be the first record on the work in progress with special focus on the shoe finds. In the centre of the former Reichsstadt Kempten (Allgäu) the so called "Mühlberg-Ensemble" is located (fig. 1). This is a group of three citizen's houses (Mühlberg No. 8, 10 and 12). The house Mühlberg No. 12 was firstly mentioned in 1411 as "Seelhaus zum Steg" (i.e. holy house to the bridge, fig. 2). In 1996 the parish community of St. Mang church, which has been its owner for 500 years, started to sanitate Mühlberg-Ensemble. In the cellar the Stadtarchäologie Kempten made a conventional excavation and at the same time the buildings were surveyed architecturally(1). During reconstruction works the Stadtarchäologie screened ceiling fillings by sifting, originally searching for lost coins and other small objects, which had fallen through gaps in the floor covering (fig. 3). In nearly all rooms of Mühlberg-Ensemble houses the space between the ceiling and the floor was filled, mostly with straw and chaff (probably derived from the urban mill in its neighbourhood - "Mühlberg" means mill's hill), bricks or rubble. These fillings were necessary as isolation material and to weight the floors against vibrations. In between older floor layers and a plenty of everydays objects from late medieval period up to about 1920 were enclosed: one of the youngest object is a grenade of World War I - which was luckily without explosives. Obviously, all these things were put into the fillings during rebuilding activities. They belong to the source group of finds concealed in buildings(2). In the house Mühlberg No. 8 the oldest layer was discovered, according to the enclosed written sources it dates from about 1470 to 1550. One speciality of this assemblage is the excellent conservation even of late medieval finds: All objects look as if they have been lying five years on the loft - but in fact they have been there for 500 years. Seams are completely intact, street mud is still sticking on shoes and textiles show the rest of pigmentation (fig. 4). The oldest complex is of special interest for archaeological and historical research. It contains charters, writing exercises, a love letter, playing-cards, wooden waste from a turnery and also about 600 leather and fur objects, which are the topic of the author's doctoral thesis(3). The biggest part of the leather finds are shoes - which is common on conventional excavations. The earliest types beyond these were one well preserved fragment of a poulaine (a.k.a. crackowe) (top is cut off, fig. 5) and a nearly complete patten. Both are characteristic forms of the 14th to 15th century (4). The poulaine shows clear cutting marks. Obviously the upper and a part of the sole had been ripped off by a cobbler using professional tools. Such kind of cutting is typical for the Kempten complex. There is a lot of cobbler's waste in this assemblage, but also about 40 nearly intact objects without damage. All injuries on the shoes are either caused by cobbler's work or by mice, which have lived for 500 years between and in these shoes - mummies of these last users of the shoes were found also. Typologically the crucial point of the Mühlberg shoes and the shoe fragments is in the period between 1500 and the first half of the sixteenth century. Apart from the undeterminable forms, Kempten assemblage contains eleven shoe types defined by their fastening method in different quantities (fig 6). Beside the mentioned poulaine and the infant ankle boots all shoes show frontal fastenings. The good preservation of the uppers and the soles enables studies in details of construction, e.g. method of lacing through five pairs of holes and the placing of facings at the inside of the fastening (fig. 7). As far as the pattern is concerned, all the uppers consist of several parts. In general the edge of the instep is either bound with a strip of leather in butted seam with whip stitch or simply trimmed with whip stitch (5). The most frequent shoe type is the low cut ankle shoe with wide opened instep and latchet fastening (type 140, fig. 8). Its upper is made of two parts and the edge of the instep is sewn with a folded top edge binding, which is made of two strips. The comparison with Renaissance style naturalistic paintings and engravings show ways of wearing and function of most leather objects. Such as Monogrammist MZ's engraving "Decapitation of St. Catherine" confirms that the opening of this shoe form was covered by a tongue (fig. 9). Archaeological and museal records reveal that this type was fashionable in the late 15th and early 16th century throughout the whole of Europe (6). According to Mühlberg material, the ankle boot with frontal latchet fastening was the most common shoe type in Kempten (fig. 10). As known from other archaeological finds, especially Kloster Alpirsbach in the Black Forest, it seems to be a typical form in Southern Germany at about 1500 (7). The shown example displays cobbler's work as well: the instep part of the upper has been cut off. Apart from this, one repair was made: a re-used hill-stiffener was sewn as a patch unusually from the outside on the quarter. The damage in the material allows for detailed insights into construction of shoes (fig. 11). All parts of the upper and strap were sewn in a closed seam with flesh-grain stitching and at each side side linings are fixed in lapped seam with whip stitch. Their bottom edge is usually integrated in the main seam between the upper and sole. As far as craft technique is concerned, the Mühlberg shoes are very uniform (Fig. 12): All adult shoes are made in turning technique, sewn inside out damp on a last. The preferred material is bovine leather; goat or sheep leather is only used for repairs. Usually the main seam includes four layers in waist: sole with flesh-to-edge stitching, rand, upper and side lining with grain-to-flesh-stitching. The main seam in the sole upperside is often countersunk in a cut fissure. The rand is composed of two to five overlaying parts. It is obviously used for three functions: firstly, it works as sealing material between the upper and the sole. In contrast to these stiff parts, the rand is made of thin and smoother leather strips closing the contact zone against moisture. Secondly, it protects the main seam against damage. As seen on Kempten shoes, each rand is as wide as the layers of the main seam on the inside of the shoes. Consequently, diagonal forces which are caused by walking would only effect the surface of the rand but not the main seam layers. Thirdly and finally, cobblers fixed repair patches on the rand. There are one to three layers of such patches possible per shoe. They cover vamp and ankle sole region. The ankle-joint is left out generally (cf. fig. 8 on the right side), either because this region is not damaged by walking or because of comfort reasons. Often there is no hole visible in the sole, but nevertheless a patch was sewn on. If one patch is worn out, it is usually not replaced, but reinforced with a second or third one. Perhaps such kind of sole doubling with patches could be a forerunner to the developed heel, which does not occur before the late 16th century (8). The heel is regularly constructed with two reinforcement layers (fig. 13): Between the upper and the heel stiffener there is an additional inner reinforcement, which is invisible and can only be perceived at the upper edge of main seam in the inside of the shoes as an additional strip of leather in the heel region. These five layers of leather are sewn together with grain-to-flesh-stitching only in the main seam, i.e. the inner reinforcement is without seam to quarters upper, whereas the heel stiffener is sewn on it in a lapped seam with whip stitch. Moreover the heel stiffener is connected to the side linings in butted seam with whip stitch. This system of reinforcements keeps the heel region of shoes upright for easy instepping. In addition, it protects the shape against deformation while walking. Although the Kempten types follow the fashion of the early 16th century - there were earlier and developed cow mouth shoes (=Tudor style shoes) as well - the welted technique, which is usually connected with these types, is lacking in them completely. Welted construction means that the upper is sewn directly to an inner sole. This unit of upper and inner sole is linked to the outer sole by means of a separate strip of leather, the welt. Probably the welt developed from the rand of medieval turning shoes. In Vevey, Switzerland welted Tudor style shoes represent the last chain of a technological evolution at around 1500 - these finds are contemporary with the Kempten ones (9). In contrast to this, the Kempten shoes keep to the medieval turning shoe construction. Such kind of coexistence between turning and welted shoes at the same time is a rare fact on archaeological sites. Both techniques are found together only beyond the staff shoes of "Don Juan" wreck (sunk 1565). Its excavator, S. Davis, stated the opinion that turnshoes are smoother and were used on board, e.g. for climbing in the masts, whereas the stiffer welted shoes belonged to the staff's dress for going ashore (10). This explanation could be possible for the light and thin ship shoes, but it does not apply to the Kempten ones: their soles were made of stable bovine leather and - as described above - were "doubled" with patches, consequently these shoes are as inflexible as modern welted shoes. According to shoemaker's statutes and historical encyclopaedias the production of turnshoes was practiced until the 18th century in general, special forms of dancing shoes have been made in turning technique until today (11). A new aspect might be the evidence of a Bavarian sumptuary law from the year 1626: this did not allow lower class people to wear welted shoes explicitely (12). The purpose of such sumptuary laws is firstly to keep hierarchial differentiation in society. It was also meant to guard poorer people from spending their money for luxury, since town government did not want them to become a problem for social service, if they could not afford their standard of living anymore. Consequently, the wearing of turning shoes could be a sign of lower social status: turnshoes were evidently cheaper than more complexly made welted shoes, because they were supposedly easier to produce or they were less fashionable. The infant shoes show nearly all the features of the adult ones. All types belong to the ankle boots because the infant foot must be protected against twisting. Their upper is composed of several parts; they may posess complex fastenings, e.g. with small hooks and loops made of bronze or iron (fig. 14). Usually there are lateral reinforcements sewn to heel stiffeners, too. In a marked contrast to the adult shoes infant types are no sheer turnshoes: All the seams of the upper are sewn on the inner side in a closed seam with flesh-grain-stitching, but obviously the sole has been fixed seperately from the outer side. Consequently the main seam is worked in grain-flesh-stitching and its thread is visible at the top and the bottom of the sole edge. The shown example displays a decorative rope-like, thick thread. Probably it was not possible to turn small infant shoes made of stable bovine leather through the narrow instep inside out. Although the construction is different from "classical" turnshoes, the characteristic rand is used at the same place, between the upper and the sole. Presumably it is used here also as sealing against moisture. Typologically this technique could be seen as pseudo-welted construction and has been found at other infant shoes since the Middle Ages (13). In Kempten the ankle area of infant shoes is reinforced by an additional sole compartment on the principle. This heel-like lifting could support the mentioned interpretation of sole doubling as forerunner of the developed heel construction. All infant shoes are badly worn, evidently they had been used by more than one child just until cobbling made no sense anymore. 5. Who wore the Kempten shoes? There are only few records about the inhabitants of Mühlberg-Ensemble, because the largest part of medieval and postmedieval sources was burnt in the Thirty-Years-War: Until 1501 a community of pious women was housed in No. 12, since that time the site has been in ecclesiastical ownership. The house No. 8 has been used as a sexton's office or a preacher's accomodation. In the 17th century the sexton has been allowed explicitely to "work furtherly as a cobbler" (14). The archaeological material itself reveals additional information in regarding the range of shoe-sizes (fig. 15): In contrast to measuring series from Bergen, London, Constance or Lübeck (15), in Kempten the share of infant shoes (up to size 35) is remarkably big. Especially the share of smallest sizes (19-25) is quite astonishing so as the fact that the upper end of range lacks adult male sizes (bigger than size 40). Evidently, in 1501 the convent managed to convert into a regular Franciscanian nunnery, perhaps because of additional donations made by rich Kempten families. The women moved and changed into a new housing, but the right of cobbling stayed back with their former house and was practiced by the sexton further on. People like the inhabitants of Mühlberg-Ensemble at about 1500 have hardly been mentioned in written records. Nevertheless they were an important and numerous group of medieval urban society in Central Europe. The complete and interdisciplinary analysis of all Mühlberg-Ensemble finds (leather, fur, textiles, wood, written sources etc. ) will reveal new and more detailed insights into their daily life. 1. For more detailed description of find situation cf. Kata, Birgit et al., Ausgrabungen im "Mühlberg-Ensemble" in Kempten (Allgäu), Archäologisches Jahr in Bayern 1996 (1997) 186-190; Kata, Birgit, Texte im Schutt und zwischen den Balken. Schriftquellen aus archäologischen Fundsituationen in Kempten (Allgäu), in: Brunner, Karl (ed. ), Text als Realie. Int. Kongr. Krems a.d.D. 3.-6. Okt. 2000, Sitzungsbericht, Veröfftl. Inst. Realienkunde des Mittelalters und der Neuzeit (Wien 2002) pp. 193-227. 2. To the phenomenon of concealed finds cf. Swann, June, Shoes Concealed in Buildings, Costume. The Journal of the Costume Society 30,1996, 56-68. 3. Atzbach, Rainer, Die Leder- und Pelzfunde aus dem Mühlberg-Ensemble in Kempten, Dissertation in Arbeit am Lehrstuhl für Archäologie des Mittelalters und der Neuzeit, Universität Bamberg. Parts of this assemblage are published in Jahn, Wolfgang et al. (eds. ), Geld und Glaube. Leben in evangelischen Reichsstädten. Katalog zur Ausstellung im Antonierhaus, Memmingen, Veröfftl. zur bayer. Gesch. und Kultur 37/98 (Augsburg 1998) 273-276 and Jahn, Wolfgang et al. (eds. ), Bürgerfleiß und Fürstenglanz. Katalog zur Ausstellung in der Kemptener Residenz, Veröfftl. zur bayer. Geschichte und Kultur 38/98 (Augsburg 1998) 101. 4. Grew, Francis; de Neergard, Margrethe, Shoes and Pattens, Medieval Finds from Excavations in London 2 (London 1988) 29-43 and 91-101. An identic parallel find to Kempten patten is located in Rüstkammer Dresden (inv. no. I 101): Bäumel, Jutta; Swann, June, Die Schuhsammlung in der Dresdner Rüstkammer, Waffen- und Kostümkunde 38, 1996, 3-33, esp. 15, Abb. 1. 6. Selected locations: Alpirsbach: Fingerlin, Ilse, Die Textilien aus dem Alpirsbacher Fund, in: Stangl, Anja; Lang, Frank (eds. ), Mönche und Scholaren, Funde aus 900 Jahren Kloster Alpirsbach (Karlsruhe 1995) 55; Schloß Bruck, Tirol: Stadler, Harald, Das höfische Alltagsleben auf Schloß Bruck im Spiegel der archäologischen Funde, in: Abarte, Marco et al. (red), Circa 1500 (Geneve, Milano 2000) 53-55, esp. 54 and cat. 1-12-7. Constance: Schnack, Christiane, Mittelalterliche Lederfunde aus Konstanz, Materialhefte zur Archäologie in Baden-Württemberg 26 (Stuttgart 1994) 26-28; Vevey: Volken, Serge and Marquita, Die Schuhe der St. Martinskirche in Vevey (CH),Zeitschrift für schweizer. Archäologie und Kunstgeschichte 1996, 1-15, esp. 7-9. Lübeck: Groenman-van Waateringe, Willy u. Krauwer, Monique, Das Leder von Lübeck, Grabung Schüsselbuden 16/ Fischstr. 1-3,Lübecker Schriften zur Archäologie und Kulturgeschichte10,1987,75 -84, Typ 11. 7. Fingerlin, Ilse, Seltene Textilien aus dem Kloster Alpirsbach im Nordschwarzwald, Waffen- und Kostümkunde 39, 1997, 99-122, esp. 54; The Kempten ones represent more elaborated version of type "Schuh mit Ristfaltung" published by Volken/ Volken (1996, cf. fn. 6) 1-3. 8. Gall, Günter, Die Entwicklung des Absatzes in der Schuhmode, Waffen- und Kostümkunde 13,1971,13-25; Gall, Günter, Schuh und Stiefel, in: Karstens, Andrea (red. ), Deutsches Ledermuseum, Deutsches Schuhmuseum, Museum 9 (Braunschweig 1981) 102-117, esp. 106. 9. Volken/ Volken, Vevey (1996). 10. Davis, Stephen, Piercing together the past. 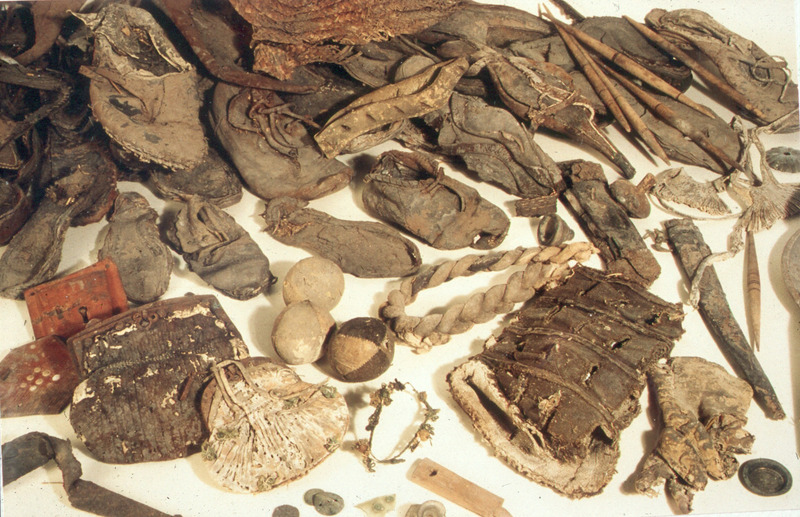 Footwear and other Artefacts from the wreck of a 16th-century Spanish Basque galleon, in: Redknap, Mark, Artefacts from Wrecks, Oxbow Books 84 (Oxford 1997) 110-120, esp. 114. 11. Krünitz, Johann Georg, Ökonomisch-technologische Enzyklopädie Bd. 148 (Berlin 1828) headwords "Schuhe" and "Schuster" and friendly oral information by Stephan van der Heyde, orthopedic shoemaker in Neustadt/ Saale. 12. Dress ordinance of duke Max I. of Bavaria from 26th June 1626, cf. Baur, Veronika, Kleiderordnungen in Bayern vom 14. bis zum 19. Jahrhundert, Miscellanae Bavarica Monacensia 62 (München 1975) 54. 13. Hlavá^cek, Petr, Der Kinderschuh aus Leder von Schloß Tirol - ein Bauopfer?, in: Spindler, Konrad (ed. ), Das Geheimnis der Turris Parva (Innsbruck 1998) 11-14. Groenman-van Waateringe, Willy, Laat-middeleeuws schoeisel, in: van Regteren Altena, Hans H. (ed. ), Stadskernonderzoek in Amsterdam (1954-1962)(Groningen 1966) 55-76, esp. 60. 14. Kata et al. (1997), cf. fn. 1. 15. Bergen: Larsen, Arne, Footwear from the Gullskoen Area of Bryggen, The Bryggen Papers 4 (Bergen 1992) fig. 75; London: Grew/ de Neergard (1988) p. 39; Constance: Schnack, Christiane, Mittelalterliche Lederfunde aus Konstanz (Grabung Fischmarkt), Materialhefte zur Archäologie in Baden-Württemberg 26 (Stuttgart 1994) 37; Lübeck: van den Berg, Tom; Groenmann-van Waateringe, Willy, Das Leder aus dem Umfeld des Lübecker Hafens, Lübecker Schriften zur Archäologie und Kulturgeschichte 18, 1992, 345-364, esp. 361 Abb. 6.2. 16. cf. Fößel, Amalie/ Hettinger, Anette, Klosterfrauen, Beginen, Ketzerinnen. Religiöse Lebensformen von Frauen im Mittelalter, Historisches Seminar N.F. 12 (Idstein 2000) passim.